Antonio “Tony” Dedal was just a young boy during World War II. It was during this time that Japan occupied Manila and it was also during this time that he watched fighter aircraft engage in dogfights above his home in Manila. By 1955, Tony was training as a fighter pilot with the Philippine Air Force, flying P-51 Mustangs. After a few years with the air force, he resigned his commission to become a commercial pilot. His first commercial experience was flying for American World War II hero, Colonel Paul “Pappy” Gunn, who had a small aviation company based in the Philippines. 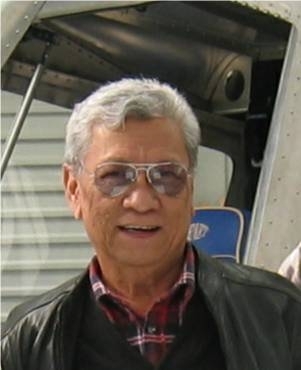 Tony has flown as a mercenary pilot for the CIA in South East Asia, operated his own air-service, flew for Philippine Airlines and eventually accepted the role as Chief Pilot for the domestic airline, Filpinas – becoming the youngest pilot commissioned to that position with any commercial airline in the Philippines. In 1971, Capt. Antonio “Tony” Dedal migrated with his young family to Sydney, Australia. It is from this home that he compiled this remarkable history, Wings Over The Philippines. It seemed to be providence that ensured Tony actually finished writing Wings Over the Philippines. Literally two weeks after he finished penning his final word on the manuscript, he was struck down with Primary CNS Lymphoma, a rare brain tumour. After three years of recovery, Tony Dedal is a survivor and Wings Over the Philippines is finally published.